Finally the 2 pandas have arrive d in Singapore on 6 Sept morning! Their chinese names are Jia Jia and Kia Kia. Both of them are not staying here for good as they are on loan from China for 10 years and will be given VIP treatment during their stay in Singapore. First they were given a farewell send off by many people in China , including Senior Minister of State for Trade & Industry Mr Lee Yi Shyan. Then, they flew by a chartered Singapore Airline Boeing 747 Cargo jet. They will stay in a $8.6 million climate-controlled enclosure built specially for them. Temp to set between 18 and 22 degrees Celsius. Humidity to set at 50 to 60 percent. The residence is named River Safari. Not only that 2 familiar faces their keepers from China will stay in Singapore for 6 months to look after the 2 pandas. To mark the pandas' arrival, companies in Singapore have come up with coins, stamps, bread and products related to Jia Jia and Kia Kia. 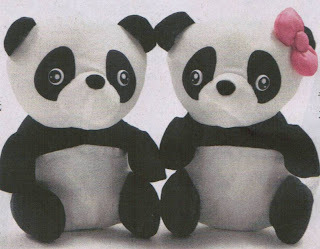 See HERE for some of the products marking the new arrival of 2 pandas jia jia and kai kai on 6 Sept 2012 in Singapore.